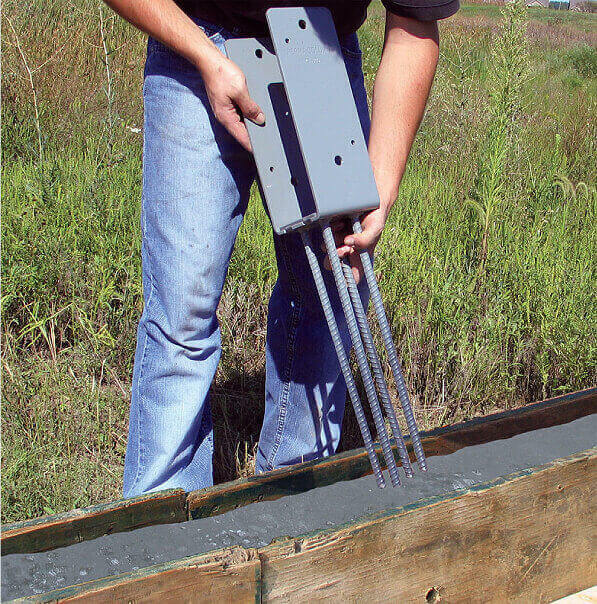 Sturdi-Wall anchor brackets are designed to connect wood columns to a concrete foundation in a typical post frame building application using a drill set installation method. This section contains drawings and descriptions for each of the Sturdi-Wall models, a chart showing allowable shear and uplift for Sturdi-Wall brackets, descriptions of several methods for attachment to concrete, and discussion of design assumptions. For wet set installation, see the Sturdi-Wall Plus section. Dimensions for the SW46, SW66, SW63, SW64, SW60, and SW80 are given in Figure 2.1. The brackets are constructed with ¼” ASTM A36 steel and ¼” fillet wells. Each assembly has a powder coat finish. The SW46 is to be used with a 4x6 wood post, SW66 with a 6x6 wood post, SW63 with a 3-ply 2x6 mechanically laminated column, SW64 with a 4-ply 2x6 laminated column, SW83 with a 3- ply 2x8 laminated column, and SW84 with a 4-ply 2x8 laminated column. Glued laminated columns are acceptable; however, the pocket dimensions need to be custom ordered to provide a snug fit. The single brackets (SW60, SW80) shall be used as pairs and fastened using the same connectors as the fully assembled brackets. The forces applied from the building columns to Sturdi-Wall brackets are a vertical uplift force, a downward gravity force, and a horizontal shear force. The wood columns should have direct bearing on the bottom to transfer axial loads directly into the concrete foundation. The Sturdi-Wall brackets are assumed to have no moment capacity. The building must be designed to resist lateral loads through diaphragm action or other bracing means. All mechanical fasteners are to be installed as per the manufacturer’s recommendations and this design manual. The brackets consist of ¼” ASTM A36 steel with 5/8” diameter holes for the bolts in the vertical leg, and ¾” x 1 ½” slotted holes for concrete anchors in the base. The brackets also have 5/16” diameter holes for screws. 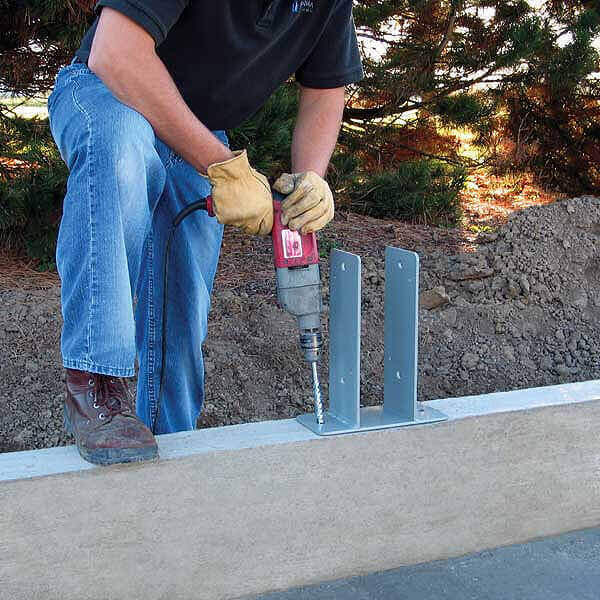 This manual includes recommendations for anchor “L” bolts, epoxy anchors, expansion anchors, and screw anchors for the steel to concrete connection. The anchor “L” bolts are to be typical ASTM A307 grade C right angle bend cast in place anchor bolts. These are set in wet concrete and must be placed within the tolerance of the slotted hole in the bottom of the bracket. Epoxy or adhesive anchors provide the maximum amount of uplift resistance; however, they must be installed in a properly sized hole and within a set temperature range in order to be effective. Expansion anchors transfer forces to the concrete by means of an expansion sleeve or wedge which presses out against the sides of the hole as the top nut is tightened. Since the expansion forces are transferred to the concrete base material, these anchors have a greater minimum distance to the concrete edge than the other anchors. Screw anchors have a hex head and a threaded shaft which can be installed with an impact wrench or conventional hand socket. There are no expansion forces transferred to the concrete base material so they can be installed closer to the edge than traditional expansion anchors. The wood to steel connection is made with (2) ½ “ diameter A307 (grade 2) bolts in double shear and ¼” x 3” strong drive screws (SDS) by Simpson Strong Tie or equal in single shear installed from each side. Typically, one screw is installed from each side of the bracket at each bolt except the SW8 series has 2 screws on each side at each bolt. Screws help prevent stress concentration around the bolt which would cause splitting of the wood members. The wood to steel connection was analyzed as per the National Design Specification for Wood Construction 2001 edition by the American Forest and Paper Association using Southern Yellow Pine wood columns. No wet service reductions have been made since the wood portion is not in contact with the soil or concrete and it is assumed to be used in an enclosed building. If the brackets are to be used in an environment where the moisture content of the wood in service will exceed 19% for an extended period of time, pressure treated wood and galvanized or stainless steel bolts should be used. In addition, a barrier membrane should be applied between the pressure treated wood post and the Sturdi-Wall bracket to provide corrosion protection. Consult your local supplier for a suitable barrier. The design of the wood post above and the concrete foundation below the Sturdi-Wall bracket, as well as, lateral bracing of the supporting structure are the responsibility of others. Table 6.1 shows the allowable shear and uplift for the wood to steel connection and the steel to concrete connection using the fasteners described above. The allowable loads for the wood to steel connection have been increased by 60% for wind or seismic loading reduced where other loads govern. The allowable loads for the concrete connection may be increased by 33.3% for wind or seismic loading where permitted by code. The steel to concrete design numbers are based on a minimum concrete compressive strength (f’c) of 3000 psi. The screw anchor design numbers are based on the Powers “Wedge-Bolt” Specification and Design Manual. 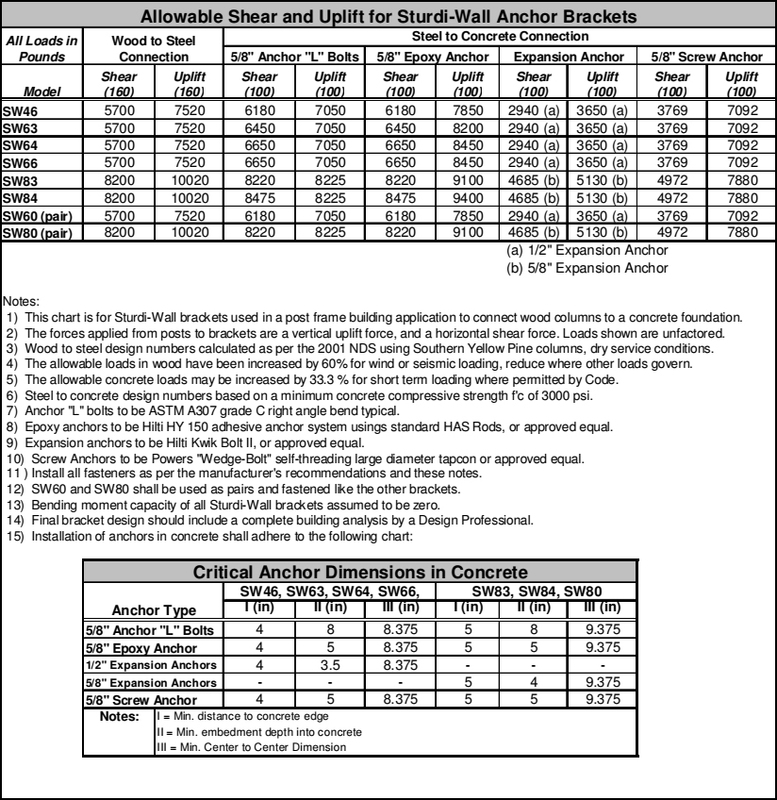 The installation of anchors in concrete shall adhere to the “critical anchor dimensions in concrete” chart. This chart shows the minimum distance to the concrete edge, the minimum embedment depth into concrete, and the minimum center to center dimension for each of the anchor types. The minimum distance to the concrete edge is given as 4” for the SW6 series and 5” for the SW8 series. These dimensions assume that the concrete edge is aligned with 2x girts installed flat wise against the outside of the posts. The 5/8” expansion anchors cannot be used for the SW6 series brackets because the 4” edge distance is inadequate. The minimum center to center dimensions are based on the physical location of the holes in each bracket type. The minimum embedment depth into concrete should be measured from the bracket to concrete interface. 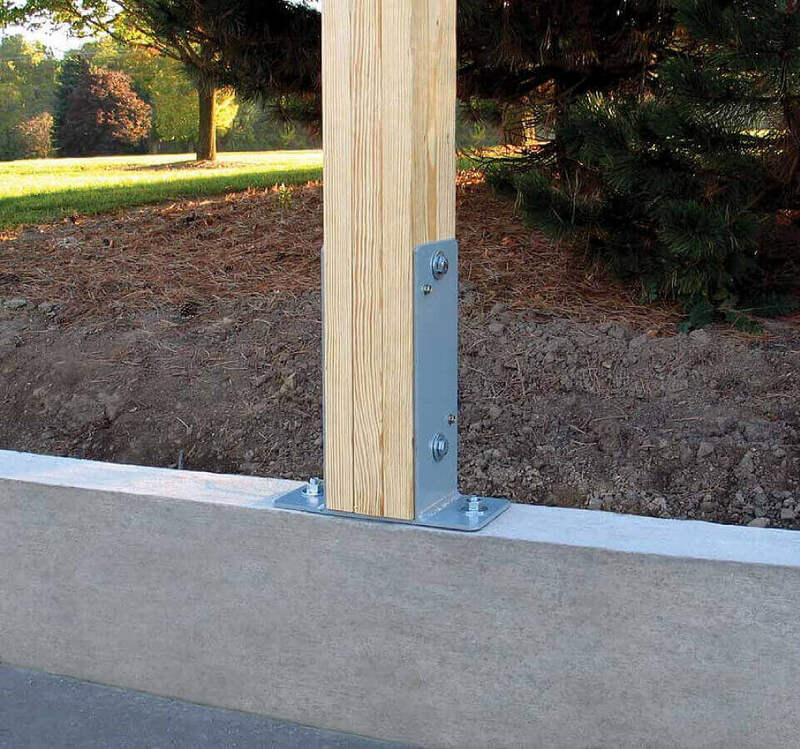 The Sturdi-Wall Plus anchor brackets are designed to connect wood columns to a concrete foundation in a typical post frame building application using a wet set installation method. This section contains drawings and descriptions for each of the Sturdi-Wall Plus models, a chart showing allowable shear, uplift, and bending moment, description of method for attachment to concrete, and discussion of design assumptions. For drill set installation, see the Sturdi-Wall section. Dimensions for the SWP46, SWP66, SWP63, SWP64, SWP83 and SWP84 are given in Figure 3.1. The brackets are constructed with ¼” ASTM A36 steel and ¼” fillet welds of E70XX electrodes. Each assembled bracket has a powder coat finish. The SWP46 is to be used with a 4x6 wood post, SWP66 with a 6x6 wood post, SWP63 with a 3-ply 2x6 mechanically laminated column, SWP64 with a 4-ply 2x6 laminated column, SWP83 with a 3-ply 2x8 laminated column, and SWP84 with a 4-ply 2x8 laminated column. The Sturdi-Wall Plus bracket dimensions are suitable for 3 and 4 ply 2x6 and 2x8 mechanically laminated columns. The forces applied from the building columns to Sturdi-Wall Plus brackets are a vertical uplift force, a downward gravity force, a horizontal shear force, and a moment about the strong axis of the column. The wood columns should have direct bearing on the bottom to transfer axial loads directly into the concrete wall or foundation. Unlike the Sturdi-Wall brackets, the Sturdi-Wall Plus brackets do have moment capacity and an allowable bending moment has been developed for each model. The building must be designed to resist lateral loads through diaphragm action or other bracing means which are assumed to be adequate to take up weak axis bending. All mechanical fasteners are to be installed as per the manufacturer’s recommendations and this design manual. The brackets consist of ¼” ASTM A36 steel with A706 weldable reinforcing bars welded to the base of the bracket, #4 (1/2”) for the SWP 4 and 6 Series brackets and #5 (5/8”) for the SWP 8 Series brackets and 5/8” diameter holes for the ½” diameter bolts in the vertical legs. The brackets also have 5/16” diameter holes for ¼” diameter Simpson SDS screws near the bolts in the vertical legs. This manual includes recommendations for the use of concrete reinforcing bar (rebar) to provide a moment connection between the steel to concrete interface. The #4 rebar anchors are to be weldable ASTM A706 grade 60 straight rebar, 18” long. Four of the #4 rebar are welded to the bottom of the SWP 4 and 6 Series Base with a minimum of ¼” continuous fillet weld. One layer of the double ¼” steel base has a hole thru it to accept the rebar and provide superior weld penetration. The rebar is then cast in place by being set in wet concrete shortly after a wall or foundation pour. The rebar must be placed within the recommended cover noted in the design chart. The cast in place rebar allows for bending moments to transfer from the column to the steel bracket and into the concrete wall or foundation. The #5 rebar anchors are to be weldable ASTM A706 grade 60 straight rebar, 18” long. Four of the #5 rebar are welded to the bottom of the SWP 8 Series Base with a minimum of ¼” continuous fillet weld. One layer of the double ¼” steel base has a hole thru it to accept the rebar and provide superior weld penetration. The rebar is then cast in place by being set in wet concrete shortly after a wall or foundation pour. The rebar must be placed within the recommended cover noted in the design chart. The cast in place rebar allows for bending moments to transfer from the column to the steel bracket and into the concrete wall or foundation. The wood to steel connection is made with (2) ½ “ diameter A325 (grade 5) bolts in double shear and ¼” x 3” strong drive screws (SDS) by Simpson Strong Tie or equal in single shear installed from each side. Typically, one screw is installed from each side of the bracket at each bolt except the SWP8 series has 2 screws on each side at each bolt. Screws help prevent stress concentrations around the bolt which would cause splitting of the wood members. The wood to steel connection was analyzed as per the National Design Specification for Wood Construction 2001 edition by the American Forest and Paper Association using Southern Yellow Pine wood columns. No wet service reductions have been made since the wood portion is not in contact with the soil or concrete and it is assumed to be used in an enclosed building. If the SWP brackets are to be used in an environment where the moisture content of the wood in service will exceed 19% for an extended period of time, pressure treated wood and galvanized or stainless steel bolts should be used, and a wet service factor of 0.7 applied to the allowable shear, uplift, and moment values in Table 12.1. In addition, a barrier membrane should be applied between the pressure treated wood post and the Sturdi-Wall Plus bracket to provide corrosion protection. Consult your local supplier for a suitable barrier. The design of the wood post above and the concrete foundation below the SturdiWall Plus bracket, as well as, lateral bracing of the supporting structure are the responsibility of others. Table 12.1 shows the allowable shear, uplift, and bending moment for the wood to steel connection and the steel to concrete connection using the fasteners described above. The allowable loads for the wood to steel connection have been increased by 60% for wind or seismic loading, reduce where other loads govern. The allowable loads for the concrete connection have been reduced by a factor of 1.6 to convert from LRFD. The steel to concrete design numbers are based on a minimum concrete compressive strength (f’c) of 4000 psi. The rebar design capacities are the calculated development length of the rebar according to the American Concrete Institute Building Code ACI 318-99. The length of rebar required for the rebar to reach its full load capacity is 19” for #4 rebar and 23.7” for #5 rebar. A reduction factor was then applied to the calculated development lengths to obtain the charted required rebar lengths. The reduction factor is a ratio of the actual tension developed in the rebar based on the capacity of the wood to steel connection to the fully developed tension capacity of the rebar. In all cases except for the SWP64 the wood to steel connection governed the design; in the SWP64 the rebar capacity governed the design. When the Sturdi-Wall Plus brackets are placed in wet concrete, care shall be taken to ensure that the concrete is not too wet that the brackets sink below the base plate and not too dry that the concrete will not flow around and adhere to the rebar. Ideally, the consistency of the concrete should be such that the rebar can be easily inserted in the concrete and the base of the steel bracket will float on the surface of the concrete. The entire length of rebar shall be embedded in the concrete such that the bottom of the steel base plate bears on the surface of the concrete. The suggested minimum concrete cover requirements shall be followed, 3” when cast against or permanently exposed to earth and 2” when exposed only to weather. Although design of the concrete wall or foundation that the Sturdi-Wall Plus brackets are cast into is the responsibility of others it is important that the concrete wall or foundation is designed to resist the shear, uplift, and moment that are transferred from the column to the concrete wall or foundation. To resist uplift a greater than or equal to weight of concrete should be provided in the foundation. The concrete foundation must also be capable of supporting the gravity loads from the columns and transferring the loads without exceeding the allowable bearing pressure of the soil at the specific site location. Sturdi-Wall anchor brackets are designed to be used in a post frame building application to connect wood columns to a concrete foundation. This can be done in a wet or drill set application depending on model of bracket that is used. The standard Sturdi-Wall anchor brackets do not transfer bending moment from the column into the foundation. Therefore, it is critical that the supported structure be designed to resist lateral loads through diaphragm action or other bracing means. 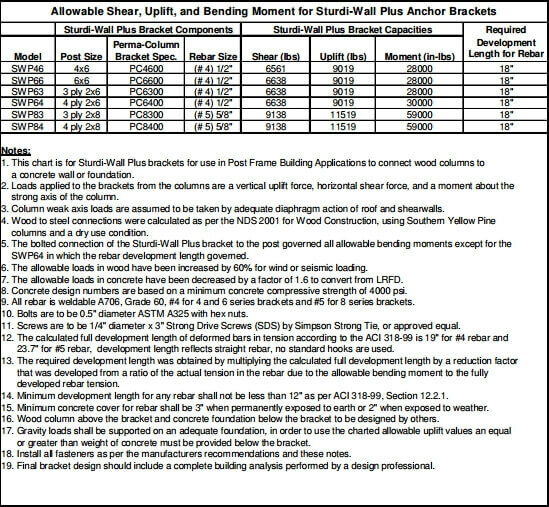 Sturdi-Wall Plus anchor brackets can only be installed in a wet set application in order for the rebar-to-concrete bond to develop correctly and create a connection that allows for bending moment transfer from the column to the steel bracket and into the concrete wall or foundation. Since the bracket capacities are based on strong axis bending of the column, it is important that the supported structure be designed to resist lateral loads through diaphragm action of roof and shear walls or other bracing means. It is also important that the concrete wall or foundation, which the Sturdi-Wall Plus brackets are cast into, are designed to resist the uplift, shear, and moment that is transferred thru the Sturdi-Wall Plus bracket into the concrete wall or foundation. Complete design calculations for the Sturdi-Wall Plus brackets are available upon request.